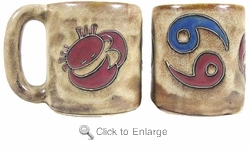 Mara Stoneware Zodiac - Astrology Coffee Mug - Cancer is the cardinal / water sign. Cancerians get things done through the power of their emotional commitment. Not only do they aggressively work to accomplish the goals inspired by their own feelings, they also know how to appeal to the emotions of others.